Dynamic Audio AmplificationBacked by 70 years of experience building high-grade audio components, the TX-NR575 amplifies accurate, noise-free signal processing with high-current power for dynamic speaker control.Smooth Analog SignalOnkyo developed Vector Linear Shaping Circuitry (VLSC) to reassemble the audio signal to its original form following processing. Unlike conventional filters, VLSC removes pulse noise generated in D/A conversion, allowing the sound wave to be reproduced with extremely high fidelity for a smooth analog signal.Powered Zone 2 and Zone 2 LineoutsPowered Zone 2 speaker outputs let you send amplified network or analog audio sources to a pair of speakers in another room. Line outputs can connect your home theater network and analog audio sources to a separate hi-fi system. 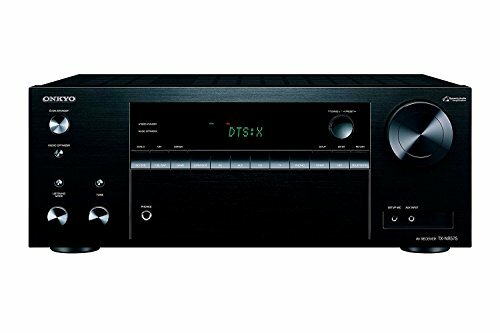 Control playback using Onkyo Controller.Unlock Dolby Atmos and DTS:XTM PlaybackObject-based soundtracks allow independently mixed sound to play through any speaker in your system. DTS Neural:XTM identifies spatial effects in multichannel soundtracks and upmixes for 3D playback, while DTS:X offers independent dialog volume control for movies.Chromecast built-inStream any music from your smartphone, laptop, or PC to the TX-NR575 with ease. Control playback with Chromecast enabled apps.Supports 4K HDR and BT.2020 Video Pass-throughConnect up to six media players to the receiver's HDCP 2.2-compliant HDMI inputs. The terminals support pass-through of 4K/60 Hz video, 4K HDR in HDR10 or Dolby VisionTM formats, as well as BT.2020 4K video standard.Wi-Fi, AirPlay, Spotify, and BluetoothSelectable 5 GHz/2.4 GHz Wi-Fi assures stable connectivity so you can enjoy smooth streaming over AirPlay, the Spotify app, and the local network. Bluetooth wireless technology also provides quick and simple wireless streaming from your choice of music application.